What would you do if you had access to a time machine? Would you use it for the (supposed) betterment of mankind, preventing the assassination of a national hero, or guaranteeing the demise of a horrible dictator? Or would you travel to the future, steal a sports almanac, and return to the past to put a bet down on the Red Sox in the World Series? You can do all those things and more in Chrononauts – provided other time-travelling mischief-makers mucking about the timeline don’t get in your way. In Chrononauts, you take on the role of a time traveller who has access to key points along a timestream – represented by a grid of 32 cards - that ranges from the years 1865 to 1999. The initial timestream defaults to events that have occurred naturally in our current reality – in other words, Lincoln was assassinated in 1865, the Titanic sunk in 1912 and Sputnik became the first man-made satellite in orbit in 1957. All seems right in the universe, but that’s very unfortunate for you since you come from a future where history unfolded very differently. Right now you’re trapped, and if you hope to ever return home, you’ve got to tweak the timeline and set things back to the way they were. 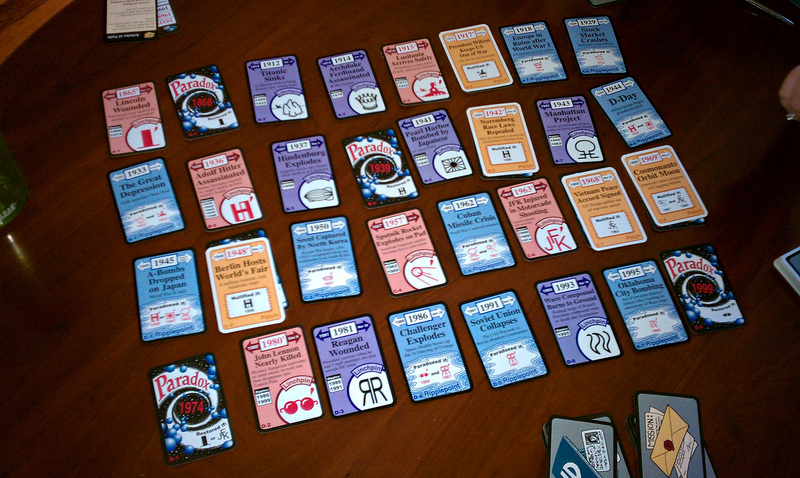 At the start of the game, each player is dealt an ID card, a Mission card and three cards from the play deck. The ID card represents the player’s time-travelling persona – a brief piece of nanofiction that outlines their history, as well as a set of dates and the events that unfolded on those key dates in their reality. To get back home, and win the game, the player has to change history to match their ID. Players may also win the game if they gather the artifacts listed on their mission cards. These cards represent items that rich or eccentric collectors have asked you to gather and bring back to the future. Players may also win if they hold 10 cards in their hands at the end of their turn. Inverters. 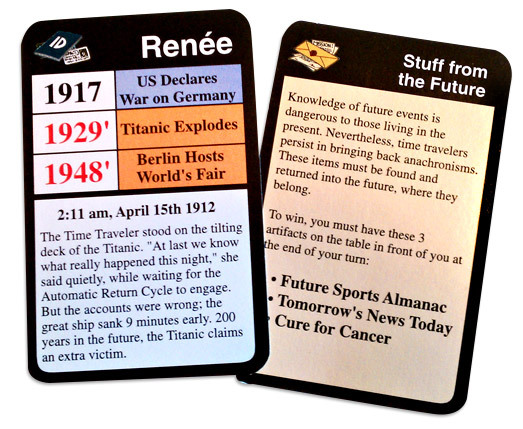 These cards allow a player to manipulate the timeline. Along the timeline are specific dates known as Linchpins. By flipping these Linchpins with inverters, a key event in history has a different outcome. This change in history can affect other events along the timeline, known as Ripplepoints. For instance, by preventing Archduke Ferdinand from being assassinated in 1914, World War I never occurs and, therefore Europe is never devastated. This ripples to 1918, so the 1918 card on the timeline is flipped, creating a Paradox. Paradoxes are dangerous holes in the timeline; if there are ever 13 or more Paradoxes in the timeline at one time, the Universe explodes and all players lose the game. This is a very bad thing. Patches. 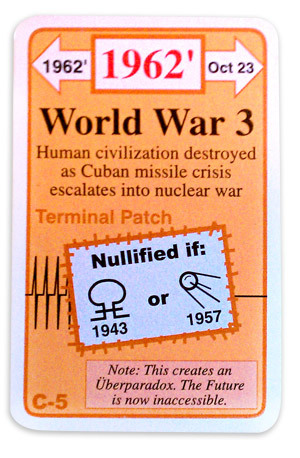 Patch cards represent alternate histories for Ripplepoints. 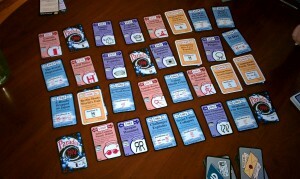 Players can use a specific Patch card to plug a Paradox hole. As a thank you from the Universe, players can draw an extra card from the play deck every time they patch the timeline. In the instance above, the Patch for 1918 can be played and history is rewritten so that the European Economy Booms. Using Patches in key time locations is the only way to win using your ID scenario – your time traveller from an alternate reality must have a couple of key dates unfold differently. Artifacts. These cards represent items scattered throughout history that a collector in the future has sent you back to obtain. Your Mission card will outline which Artifacts you’ll need to collect. Artifacts are played by laying the card in front of you, but be careful – there are other cards in the deck which will allow your opponents to steal them from you. Actions and Timewarps. These are cards that bestow a certain special ability to the player when played. They can range from the Action card “Get There First” (steal an artifact from any player – told you), to cards like “Rewind” (take a card from the discard pile and immediately play it) and “Memo From Your Future Self” (cancel a card as it’s being played). These add a definite madcap atmosphere to the game, but can be used wisely to turn the tide in your favor at key moments. A fairly-mucked-with timeline, complete with Paradoxes and Patches. Click to embiggen. Over the course of a game, the timeline will shift dramatically. There are a few key Linchpins that will get Inverted constantly, especially the key date of 1936 that defines the rise or fall of Hitler that can flip up to five Ripplepoints in its wake. Several time-traveller IDs depend on patching key dates within the span of the WWII years, so it’s likely that you’ll be competing constantly with other players to keep those Ripplepoints intact or flipped to Paradoxes. This dynamic gameplay keeps the game fresh and ensures that every player must think on their feet and be creative with the use of Actions and Timewarps so they can grab cards from the play deck or discard pile that are vital for a win. Patches are key to winning with an ID, and the fact that they also reward a player with an extra card draw makes them an attractive option on each turn. However, in many games the win conditions for a player’s ID may be taken care of for them by another player’s Patch on a previous turn, so there’s always a little bit of tension whenever you place one over a Paradox. The inclusion of several win requirements is a wise mechanic in Chrononauts – some time travellers will find themselves poised to take the game through the clever use of Patches, but for those who see the timeline hopelessly screwed up can still focus on playing or stealing Artifacts to fulfill their Missions. And there’s always one quiet little timelord sitting back and gleefully gaining cards each turn to try and win with 10 cards in their hands. Pretty sneaky, sis. Overall, Chrononauts is an absolute blast to play. There’s something inherently fun about messing with history, and the alternate outcomes along the timeline through flips of Linchpins and subsequent patches is filled with whimsy and humor. 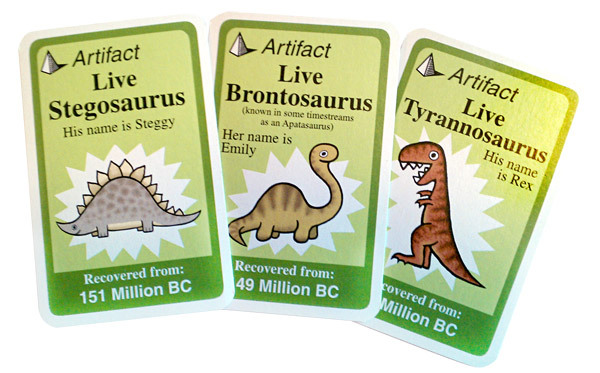 The Artifacts and Missions are lighthearted and often adorable; the dinosaurs, in particular, are always popular, and I have witnessed many a game where Steggy (the Stegosaurus) and Emily (the Brontosaurus) have been fought over for their sheer cuteness factor. The ID cards add a whimsical role-playing nature to everything, as well – each character has an intriguing backstory, and the mix of different alternate realities is refreshing. There’s even a sentient cockroach from the future that wants to make sure that World War III unfolds! As fun as games can be, it’s a bit difficult to pinpoint exactly why Chrononauts works as well as it does. The gameplay can be a tad unbalanced, it’s often difficult to fulfill your ID requirements so you can return to your own timeline, and the time stream that you have so lovingly transformed for five turns can be undone with a single card play. And yet, despite all the temporal madness and game after game of losing miserably, most players return to the game with childlike enthusiasm, as if this time they will set right what once went wrong, and hope that their next leap will be the leap home. Gameplay is really unique and often challenging - and the timeline mechanic is patented! The concept of the Linchpin/Ripplepoint dynamic is a bit confusing, at first, but after a couple of plays feels very natural. Replay is fantastic, with a changing timeline and multiple Missions and IDs. The card stock is standard Looney Labs fare, which means it's sturdy and easy to shuffle. 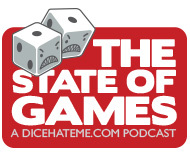 The art is minimal but quirky and adds a lot of fun factor to the game. The theme is - well, it's time travel, so it's awesome. With a lighthearted and intelligent group, Chrononauts is the perfect game to break out. The timeline often sparks discussion, and messing with someone's carefully-reconstructed history brings mischievous glee. Overall score: 16 out of 18 - Bring on the temporal shenanigans! 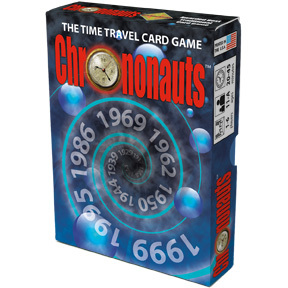 Chrononauts is a game for 1 to 6 quantum leapers, ages 11 to Adult, and retails for $20 at your favorite local game store or from the Looney Labs online store.